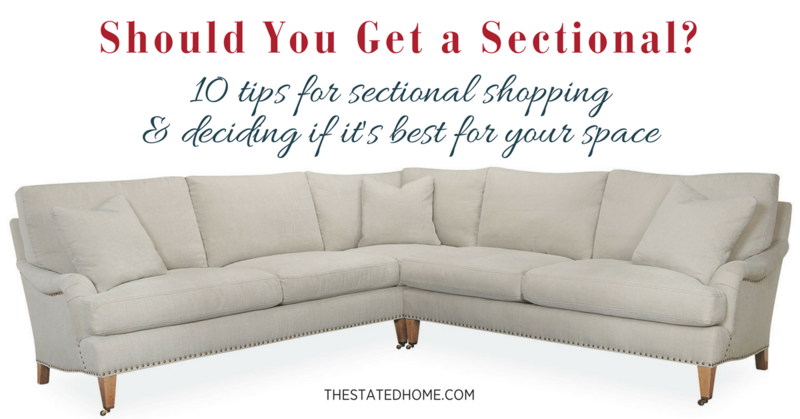 Sectionals provide a lot of seating. If you’re looking for lots of space for people to sit, a sectional can provide that. One note: When you’re counting capacity, don’t include the corner. Someone can only sit there if their feet are up on another cushion. Large rooms may not need a sectional. A big room filled up with a big sectional is like a fridge full of dessert: fun at first, but it gets boring fast. The most interesting rooms have a mix of furniture pieces, so think if you’d rather have two sofas (they don’t have to match) or a sofa and group of chairs. Chaise sectionals are ideal for lounging and for rooms with a view. Chaise sectionals can provide extra seating, but their main purpose is to give you a seat where you can easily put your feet up. Because there’s no back to one section, these work well in spaces where you have a window or don’t want to close off an area. In a pinch, people can sit on the end of the chaise, but they won’t have a back to lean against. If you want the functionality of a chaise, but not a permanent piece of furniture sticking out in the room, consider getting a sofa with a matching ottoman that you can move around as you wish. L-sectionals work especially well in small spaces. While many people assume that large sectionals are for large rooms, you’ll get the most benefit in a small room. Sure, sectionals are typically big pieces of furniture, but put one in a corner and you’ll maximize the use of a small space. Bumper chaise sectionals are a hybrid of L- and chaise sectionals. Some sectionals come with a bumper chaise option, like our Seattle or Palm Springs. These provide the extra seating of an L-sectional while still keeping the space looking open (because one end doesn’t have an arm or back). Bumper chaise sectionals work great in front of windows or smaller spaces. Double-width chaises are for cuddling and narrow rooms. If you want a chaise but need to keep a walkway open or don’t have a long wall to push it up against, opt for an extra-wide chaise. It’s twice the width and typically not as long as other chaises. See it in our Palm Springs. Sectionals with two chaises are for bigger rooms and create lots of lounging opportunities. A double chaise sectional has a chaise at both ends. This configuration can be seen in our Menlo Park Double Chaise Sectional, which is even more fun because each chaise is extra wide for two people to cuddle on. It’s a good solution for a large TV room, since it lets lots of people settle in and get comfy. If you like another one of our sectionals but want it with double chases, contact us and we can work with you. In most cases, avoid the U-sectional. 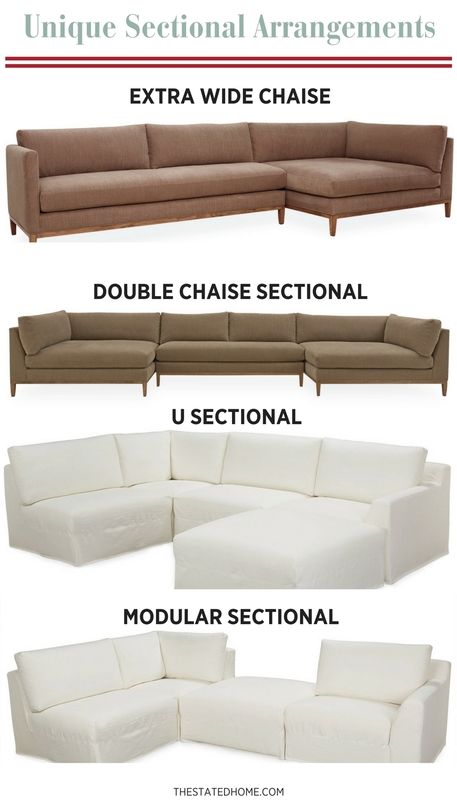 A U-sectional is shaped like, you guessed it, a U. It has a middle sofa piece with two other sofa sections—one on each side. It takes up loads of room and is just so much sofa. The only room these can work in are separate theater rooms or kids spaces where there isn’t much use for other furniture. Modular sectionals are good for those who move. People get so excited over modular sectionals, which are sectionals where each seat is its own piece. With modular sectionals, you can reconfigure the seats in different ways. In theory, this sounds great. But what happens most often is you quickly figure out the best configuration and just leave it that way. That said, if you tend to move a lot and really want a sectional, this might be the best choice for you. You can adjust the lengths of the sides as needed. Keep in mind that you’ll still need to pick out specific corner and end pieces (all the others are just armless chairs). Add in an ottoman or two to create chaises. « Sectional Sofa Pieces: What Do They All Mean?